Metal power Analytical participated in Automotive Engineering Show, Chennai which happened from 9 to 11 November 2017 at Chennai Exhibition Center, Chennai.Metal Power Analytical have occupied the large Booth B21 of 40 sqm space.At the booth, the company showcased the live models of the high-end Metavision 1008i3 and the best-selling Metavision-108NN+ OES models. Metal Power Analytical is Participating in IFEX 2018 Exhibition, Gandhinagar occurring on January 10-12, 2018 at Helipad Ground, Gandhinagar, Gujarat.Metal Power Analytical have occupied the large Booth C10 of 108 sqm space. Metal Power is participating at Power On Exhibition at Jaipur on 8-11 January 2018.Metal power Analytical is the Platinum Sponsors of the Event. Metal Power Analytical have occupied the large Booth Platinum Stall of 40 sqm space. Metal Power is participating in ACMEE 2018 from 21-25 June 2018 at Chennai Trade Center, Chennai.Visit us at Booth No B-149. Metal Power Analytical have participated in the Jamnagar Tech-Fest Event occurred from 5-8 January at Jamnagar Bypass Rd, GIDC Phase-2, Dared, Jamnagar this year.Metal Power Analytical (I) Pvt. Ltd. won the Excellent Performance award at Jamnagar Tech-Fest Event.Our Booth 18, 19 was located in Hall no.7. 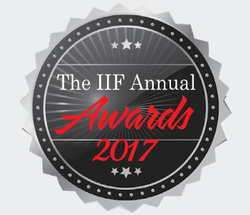 Managing Director of Metal Power, Shri P D Pant has awarded to CHANDRAN MENON MEMORIAL AWARD FOR APPLIED RESEARCH & INNOVATIVE TECHNOLOGY for the year 2017 during the IIF Annual Awards function at the 66th Indian Foundry Congress on 10th January, Gandhinagar. Once again, Metal Power Analytical (I) Pvt. Ltd. has proved that innovation is the core competency with two innovation awards in 2017.